The film THE P STORM (P FUNG BO) two nights ago held a wrap banquet. 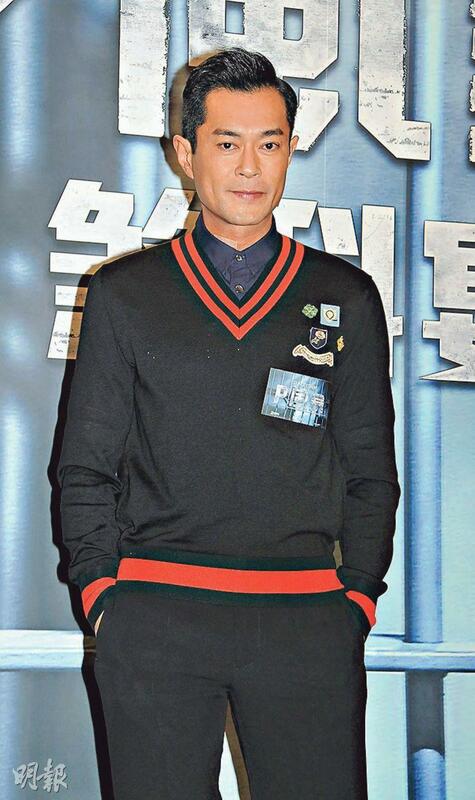 Actors Louis Koo Tin Lok, Raymond Lam Fung, Kevin Cheng Ka Wing and Chrissie Chau Sau Na attended. Cheng Ka Wing looked tired when he arrived. Two nights ago after the banquet he and his wife Grace Chan Hoi Lam announced their impending parenthood online. Chau Sau Na said that she would not talk about Ka Wing and having a baby, as they focused on talking about fitness. Because in the film Goo Jai, Lam Fung and Ka Wing were in great shape, she could not be "bigger" than them on camera. Chau Sau Na also joked that this time men surrounded her in the film. The most memorable were the chase scene and gun fight scenes at the stadium, and being at sea to board a helicopter with Cheng Ka Wing. Luckily they both have been working out. Did she feel Ka Wing was very cool? She said, "Isn't he always cool? He misbehaves, but he is all talk. Actually he is very nice. After working together 4 times we are pretty familiar." Koo Tin Lok has already made the 4 film in the STORM series. He said that this time he had to investigate at the correctional services and would have his share of action scenes. Luckily they wrapped up before his surgery. Now after surgery he would still have pain when walking or jumping. Goo Jai has had herniated disc problem for 2 years and always relied on pain medication. He said that his mother had the same problem but because he often worked on action scenes his condition was even more severe. He also did not have time to have daily physical therapy. In the end he chose surgery. Goo Jai however would not agree to his mother having surgery as well, because it was not a minor surgery. If physical therapy would resolve it then she should try to. Goo Jai was in a half resting state, but actually next week he would have to work on a crime film and BACK TO THE PAST. Originally the doctor told him that his wound would take 4 to 6 months to heal, but he could not do anything about that. 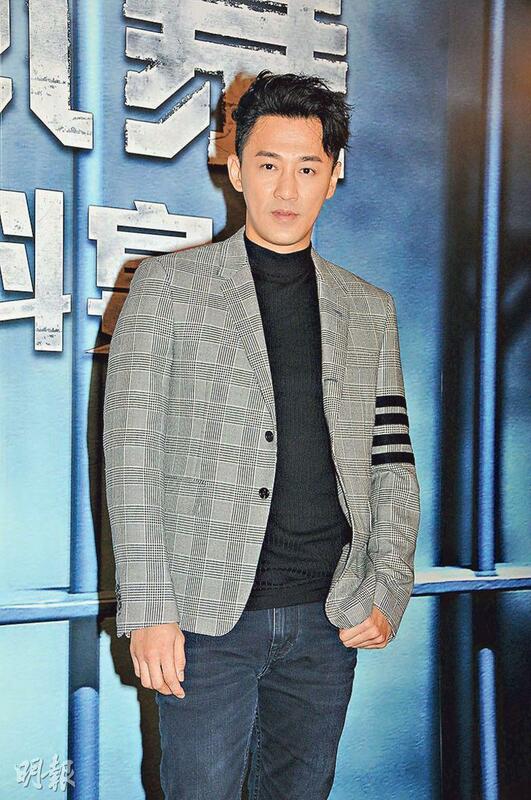 Lam Fung in the film got his wish as he played a villain. He said that after 20 years in the business he finally was able to play characters that he has not been able to play before. He even wanted to play characters with abnormal psychology or schizophrenia. "This time had some break through, and I got to work with Goo Jai again since A STEP INTO THE PAST. It was a warm up for the film version." Did Goo Jai praised his acting improvement? Lam Fung said that Goo Jai advised him. Starting this year he would have a lot more opportunities and hope to give the audience something fresh. He also pointed out that this time he had many fight action scenes with Goo Jai, only that he had no chance to show off his muscles. "I am already fatter, actually I am not thin at all. In addition the character doesn't have to take off his clothes, so I can eat and drink normally. Lately aside from work, life has been great as I share it with family and those around me. Thank you everyone for your concern. Right now everything is great." He said that he would not talk about anything outside work in detail. He wanted everyone to pay attention to his work because he put a lot of effort into it. "I am not sharing anything personal, everything is great!" When asked about former girlfriend Karena Ng Chin Yu wanting to get back together, Lam Fung said, "Thank you everything, bye bye!"